Alive: The Faith Forward program, above all else, is alive! It is an exciting and friendly way for young people to learn about their Catholic Faith. Above all else it strives to help prepare the students to live their faith in a challenging environment. Faithful: The Faith Forward program is faithful to the 2000 year tradition of the Faith. Its content is consistent with the teachings of the Catholic Church and Apostolic tradition. 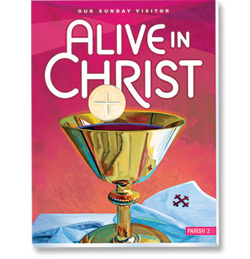 The Faith Forward program uses the Our Sunday Visitor's Curriculum "Alive in Christ" series. This series focuses on the Catechism of the Catholic Church and builds upon the children's knowledge from year to year. Each chapter begins and ends with prayer. Fun: Lessons and Carols, Living Stations, and various service-based projects give life to the program as we begin to experience God's love for us and each other. These events are followed by a Parish Dinner! When? : Each Sunday Morning from 10:10 to 10:50 AM at St. Monica Catholic Church. Bring your kids directly to the classroom. The program runs September through May, following the Mercer Island School District Calendar for days of closure.